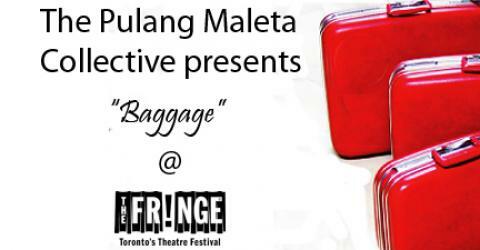 Baggage is a collection of five short plays interwoven together as an exploration of shame. The individual pieces named “Claim Your Baggage”, “Maria”, “Not My Exotic”, “The Edge of Family” and “Touch” were all developed as part of a collective of first‐time playwrights yearning to share the unique experience of what it means to be Filipino‐Canadian. The group was made possible through the Play Creation Unit at the Carlos Bulosan Theatre. • “Claim Your Baggage” by Christine Mangosing is a humorous look at cultural shame and a reminder that if you don’t look back at where you came from, you’ll never get to where you’re going. • “Maria” by Aura Carcueva is about the struggle of a daughter’s family obligation, independence, and the desire for a new life through a mail order bride arrangement. • “Not My Exotic” by Darrel Gamotin ‐ A woman and man’s rendezvous unravels into something more. • “The Edge of Family” by Vincent Galvez ‐ Over the course of a dinner, a beautiful young girl must choose between her crime figure boyfriend and his DJ best friend, with no help from her envious mother. • “Touch” by Reese Baguio is about a young woman hindered by her conservative upbringing who struggles to navigate the world as a new lesbian. With the help of her misguided mentor, a flamboyantly Filipino drag queen, she tries to find love, and more importantly, learns how to… breathe. The five emerging playwrights formed a collective named “The Pulang Muleta Collective”. “Pulang muleta” means “red luggage” in Filipino and references the bright red suitcases that are the common element of the pieces as a constant reminder of the universal theme of shame. Our chosen venue is the Kapisanan Philippine Centre for Arts and Culture (167 Augusta Avenue) in Kensington Market. We chose this location because it’s the first youth‐led arts centre dedicated to Filipino‐Canadians and is focused on developing our burgeoning artists, and contributing to the mosaic of the Toronto arts community. Because of this, we felt that housing our production in an arts space where youth go to explore their cultural heritage, it would demonstrate the power of art to reclaim identity, and bring focus to the contributions of the Filipino community.